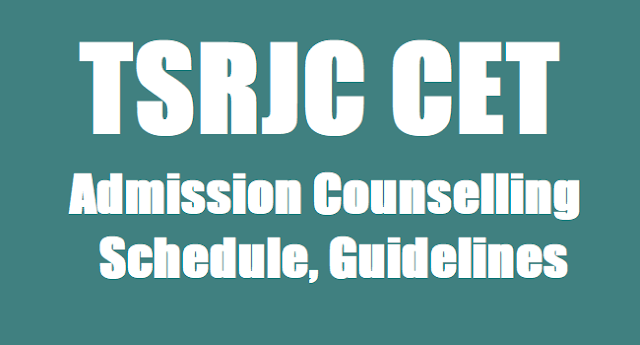 #TSRJC CET 2019 Notification-Online Application Form/ TREIS TSRJC CET 2019 Admission Counselling Schedule, Guidelines, Important Documents, Certificates: Telangana Residential Educational Institutions Society(TREIS), Secretary is going to issue the TSRJC Admission Schedule Notification 2019 in March, 2019 for admission into intermediate first year in 4(four) Telangana State Residential Junior Colleges(TSRJCs) for the academic year 2019-2019. In this regarding certain instructions have been issued and a committee has been constituted in this purpose. TREI Society would be conducted common entrance test on ....05.2019 for admission of students into Inter I year in TSR Junior Colleges. Results are released for public. Candidates are shortlisted to attend the admission counselling based on the merit in the entrance test and rule of reservation. Candidates are called in the ratio of 1:10 in open category and in the ratio of 1:5 in reservation categories for the available seats. All the short listed candidates were informed through SMS and in the result sheet downloaded by them to attend the admission counselling along with original certificates as per the schedule. Further, category wise shortlisted candidates’ particulars are made available to the Principals on the TREI Society Web Portal. As the applications are received through Online and candidates are shortlisted based on the merit and community reservation, verification of certificates is essential for confirmation of admission to the meritorious candidates. Following are the instructions issued to the candidates who are attending admissions counselling. Instructions issued to the candidates shortlisted for admission counseling Candidates are called for admission counseling in certain ratio to the available seats. Candidates for Open category seats are called in the ratio of 1:10 and for Reservation category the ratio is 1:5. Hence, admission is not assured for all shortlisted candidates. Admission will be provided based on the merit, rule of reservation. Pass in the qualifying exam in the first attempt in March 2019. OC candidates must secure minimum of GPA 6 and BC, SC, ST candidates must secure minimum of GPA 5 in SSC or equivalent Examination. Telugu Medium and Urdu Medium candidates opting English Medium should get minimum of GPA 5 in English subject in their qualifying examination i.e. SSC. 1. Original pass Certificate of SSC or its equivalent Exam and Marks Memo / at least internet copy. 6. Three Sets of Xerox copies of all the above certificates. Six latest Passport size photographs. 1. PHYSICALLY HANDICAPPED: A Certificate from the Orthopaedic Surgeon of the Govt. Hospital (Minimum disability - 40%). 2. Children of Armed Personnel CATEGORY: A Certificate from DSSA (or) from the competent authority for children of Ex-Service personnel (or) the Children of Service personnel from the state of Telangana. 3. SPORTS: A participation certificate at National/State/Zonal/District level issued by the Sports Authority concerned, District level Participation certificate is the minimum eligibility. Special fee of Rs.930.00 for MPC/BPC candidates and Rs.570-00 for MEC/CEC candidates. Maintenance charges: Rs.1000-00 per annum for all candidates. The candidate along with his/her Parent has to report to the Convenor at Counselling venue on the above mentioned date. Counselling will commence at 11.30am. Candidate has to report at the venue by 11am without fail. If fails to report on the date of counselling, they will not be considered for admission and no further correspondence will be entertained. 1.College Uniform Boys : White Shirt, Sky Blue Pant :2 Pairs Additional: White Shirt, White Pant -1 Pair, Night Pajamas –2 Pairs. 5. Chappals: 1 - Pair, Mosquito net – 1No, Bucket - 1, Mug - 1, Plate - 1 , Glass - 1 and other minimum bedding material. *on ....06.2019 for MPC at TSRJC, Hasanparthy, Warangal district.